Healthkart Consult app is your one-stop fitness destination. 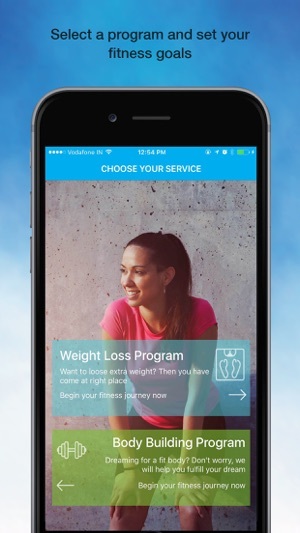 With the Healthkart Consult app, losing weight and getting fit become more easy. 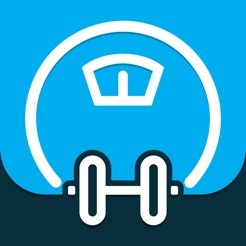 This app connects you with qualified nutritionists and fitness trainers who give you personalized diet plans along with training routines that help you achieve your fitness goals. Don’t have time to go to a dietitian? 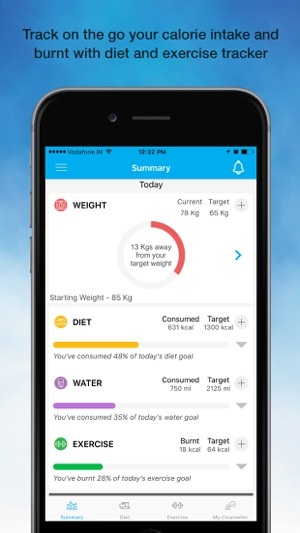 Don’t worry, losing weight, keeping fit and eating right is hassle-free, effective as well as impactful with this app. In short, this app is the easiest way to feel in control of your body! #Set your Goal: Be it weight loss goal, bodybuilding goal or eating healthy diets, the app provides a customized fitness program to become the fit version of you. #Free Diet Chart: Whether you want to lose weight or build a muscular body, the choice is yours. You will be provided with extensive custom diet plans, nutrition kits and counseling sessions. #Free Weight loss Program: Get a free customized diet plan and a counseling session put together for you by an expert nutritionist. #Free Bodybuilding Program: For all fitness enthusiasts, a free exercise chart along with a counseling session with an expert will be scheduled. #Diet Tracker: Track the amount of calories you need, what you need to eat to maintain a balanced diet and how much you’re consuming each day! #Exercise Tracker: Work out according to the training videos and app will track the calories you burn. #Measure your progress: Track your daily performance for a more precise control over your fitness regime- all you have to do is comply & log your diet and exercise regularly & app will calculate the calories consumed and burned for you. 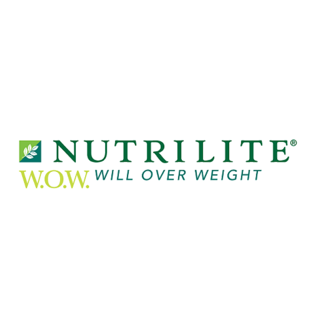 #Real time fitness counseling and unlimited message support: A dedicated team of fitness experts and nutritionists follow up with you regularly and resolve all your queries. #Blogs: Fitness and weight loss guides provide further insights about new happenings in the world of fitness. #Tip of the Day: Nutritional and work out tips from Nutrition experts & fitness trainer keep pouring in to keep you energized and focused! #Notifications: Don’t miss out on new offers or scheduled calls. 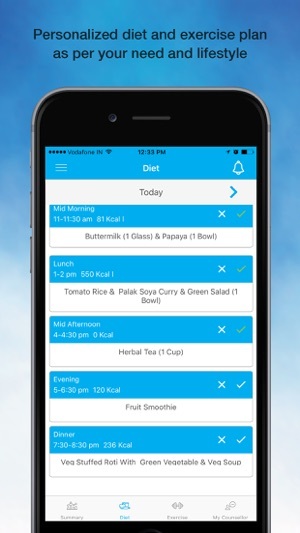 Following the diet plan and exercise routine is important, so app remind you if you have not logged in or have skipped a meal. #Referral program: With Get Your Buddy program, get your companion to sign up for his fitness journey along with you. #Testimonials: We bring to you success stories of many of our happy customers to keep you motivated. Win, even when you lose! 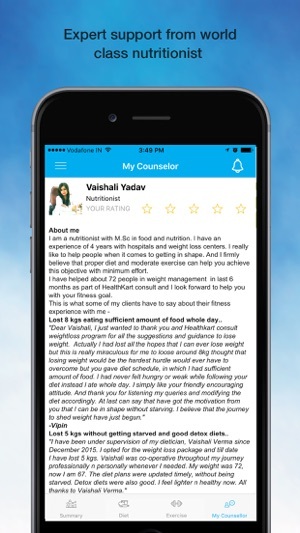 Fulfill all your goal-oriented fitness plans with the Healthkart Consult app! So, what are you waiting for? Download the best free online fitness app now and please share your feedback with us at consult.tech@brightlifecare.com in case you face any problems. * Profile form changes for Bodybuilding & Weight loss. 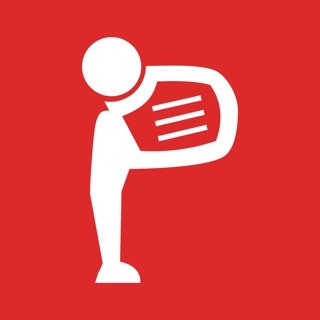 Download the app and fulfill all your fitness goals! !